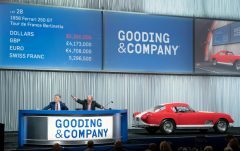 Design-driven performance cars such as a Ferrari 275 GTB, Ferrari 500 Superfast and an American Motors AMX/3 are on offer at Gooding Scottsdale 2017 sale. 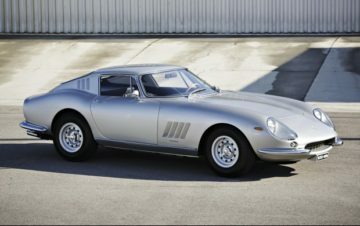 The 1966 Ferrari 275 GTB Long Nose Alloy and the 1965 Ferrari 500 Superfast have pre-auction estimates of around $3 million. The Superfast is also super rare as on 36 were made. 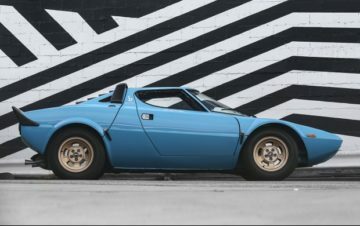 The 1969 American Motors AMX/3 and the 1975 Lancia Stratos HF Stradale are two further fast cars with edgy designs that will be on offer at the Gooding Scottsdale 2017 sale in Arizona, USA. A silver 1966 Ferrari 275 GTB Long Nose Alloy (Estimate: $2,900,000-$3,200,000), chassis 08117, joins the previously announced 1967 Ferrari 275 GTB/4 (Estimate: $3,000,000-$3,400,000) at the Gooding Scottsdale 2017 sale. Designed by Pininfarina with coachwork by Scaglietti, the Ferrari 275 GTB Long Nose Alloy is the ultimate road-going 275 GTB Ferrari. Scaglietti built just 205 examples with the desirable long nose body style, of which only 80 were the lightweight aluminum variants. The alloy-bodied Ferrari 275 GTB presented here, chassis 08117, was completed in late 1965 and finished in the elegant color scheme of Grigio Argento Metallizzato (silver) over a black leather interior. The car was restored by Italian specialists Brandoli, Sauro and Luppi, who upgraded the engine from its original three-carburetor setup to the more desirable six-carburetor arrangement for enhanced performance. Offered for sale in the US for the first time in over 15 years, this superb 1960s berlinetta has been Ferrari Classiche certified and presents a great opportunity for the discerning collector. The 1965 Ferrari 500 Superfast (Estimate: $2,800,000-$3,200,000) are amongst the rarest of special Ferraris with only 36 ever produced. Introduced at the Geneva Auto Show in March 1964, the Ferrari 500 Superfast was the ultimate offering to the marque’s wealthiest clients. 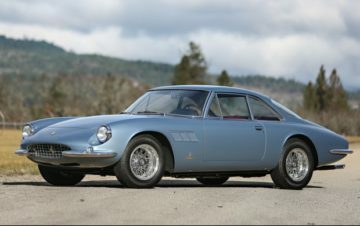 Only 36 examples were built and the price matched the exclusivity, as the 500 Superfast was nearly double the price of any other Ferrari the company offered in the 1960s. Equipped with a 5.0-liter V-12 producing 400hp, this sleek missile was capable of nearly 175 mph, yet was also very comfortable for long-distance touring. The stunning 1965 Ferrari Series I 500 Superfast, chassis 5989 SF, offered at Gooding Scottsdale 2017 is an original left-hand drive car and only the seventh example built. Sold new in California, beautifully restored by leading West Coast specialists, and Ferrari Classiche certified, this stunning 500 Superfast is a unique opportunity for the true connoisseur of the finest classic cars. These cars are rarely offered at public auction, and today, as when new, they remain one of Ferrari’s finest bespoke Gran Tourers. 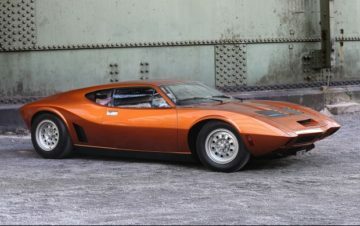 The 1969 American Motors AMX/3 (Estimate: $900,000-$1,300,000) is a rare change to buy a very special American car developed by amongst others AMC, BMW, ItalDesign and Bizzarrini. The 1975 Lancia Stratos HF Stradale (Estimate: $500,000-$600,000) on offer at the Gooding Scottsdale 2017 sale was once in the Rosso Bianco collection in Germany. The Lancia Stratos was built with one mission in mind, to win World Rally Championship titles. With a chassis and engine from the Ferrari Dino and a striking design by Bertone, the Stratos looked like nothing else the world had ever seen and went on to win three consecutive titles. The road-going version of the famed rally car, such as the example presented here, chassis 001948, was completed at Bertone’s Grugliasco works in 1974 and painted in the rare Azzuro (Blue) livery. This particular car was once part of Peter Kaus’s famed Rosso Bianco Collection in Germany. Only 492 examples were produced, and this Stradale example is one of the best Lancia Stratos ever offered for public sale. It has undergone a recent comprehensive cosmetic and mechanical restoration and ready to be enjoyed by its next owner. Cars previously announced by Gooding for its 2017 Scottsdale sale include pre-war classics such as a 1925 Bugatti Type 35 Grand Prix car and a 1932 Alfa Romeo 6C 1750 Grand Sport Cabriolet as well as several very desirable sports cars including a 1967 Ferrari 75 GTB/4 and a 1955 Mercedes Benz 300 SL Gullwing.